Deon and I had both suffered fairly serious physical injuries during the past two years and as a result our paddling adventures had stalled. Recently we had tentatively ventured back into the sea kayak, and this weekend we resolved to paddle around to one of our erstwhile haunts, the Steenbras River mouth. Now we were also armed with drones, triumphs of engineering which are really flying cameras. The short video clip below was shot at Steenbras using my Mavic Pro before the return paddle to Gordon’s Bay. But the absolute highlight of the trip – after the adrenaline rush of punching out through a fairly rough mouth – was a whale which porpoised within spitting distance of us. We had noticed disturbed water on the way in in the deep trench at the mouth and had minutes earlier spotted a large dorsal fin off our bow. The anglers on the rocky promontory at the mouth had signalled cryptically to us as we cleared the surf, but we were unsure what they were referring to – now we knew. At first I thought that it was a humpback whale, but after doing a little research on the colour, shape of the dorsal fin and which whales frequent False Bay, I suspect that it was a Brydes whale. The sighting was a first for Deon and me in these waters. Some years ago we had happened upon two Southern Right whales in the mouth where the waters are so deep and dark that these leviathans simply disappear. All in all it was a very satisfying day on many levels. I had been wanting to walk this trail again for a while but had found it a little difficult to determine how and where to book it. Eventually it was booked in time for Peter’s annual pilgrimage to Africa – and coincidentally it was timed for almost eleven years exactly since we last hiked it in the company of Brian, a schoolmate who was visiting from Australia once again, but would not be joining us this time. The trail is adequately described in the post about that hike eleven years ago. 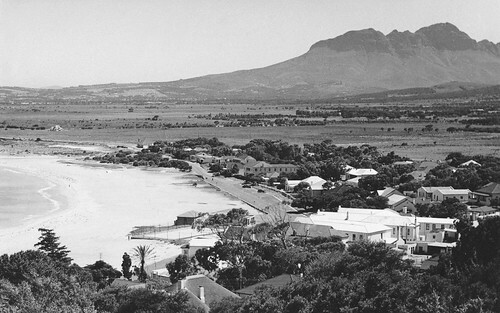 If anything the western sector was more scorched by fire this time, with the shallow valleys leading down to Sirkelsvlei and Olifantsbos resembling white deserts. When we looked back over the trail from Rooihoogte it seemed clear that the latest fire had been ignited adjacent to the busy road leading down to Cape Point. Any guesses as to how it started? The sparse vegetation made it extremely easy to spot eland, bontebok and a troop of baboons picking their way across the sands, however. On day 1 a warning call also caused us to spot a pair of klipspringers on Kanonkop, who watched us warily as we circled east and south of them. At Peter’s suggestion, prior to his annual pilgrimage back to the Cape, we booked a couple of nights’ camping in Grootvadersbosch with the idea of perhaps hiking to the Boosmansbos forest. We had undertaken the 2-day wilderness hike way back in 1999 in mist and rain. 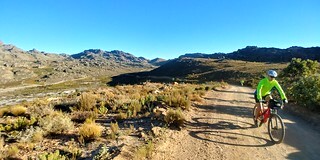 I had also hiked down to Grootvadersbosch at the end of a Rim of Africa stage from Montagu and had been struck by the beauty and location of the small campsite. After an afternoon strolling around the forest that is Grootvadersbosch, we struck out the next day for the watershed that overlooks Barrydale north of the Langeberge, having decided that the Saagkuilskloof trail looked too burnt. As we left the forest, a large bush pig (wild boar?) that had been spooked by the warning calls of monkeys, barrelled out of the undergrowth, unsuccessfully hurdled the road embankment and then hurtled uproad, luckily away from us, before disappearing into the forest. That was a new experience for both of us. We lunched on the watershed and were surprised by a glider riding the updrafts along the ridge, the only warning being a soft buzz. Surprised by our energy levels, we completed the 23 km hike through 970 m. As Peter remarked in a FB post: “not bad for two old farts on the wrong side of sixty”. Botmaskop is a 910 m peak near my home and is the first mountain I see when I leave for work each morning. Its form is unique in the Jonkershoek ranges, resembling the prow of a dreadnought. 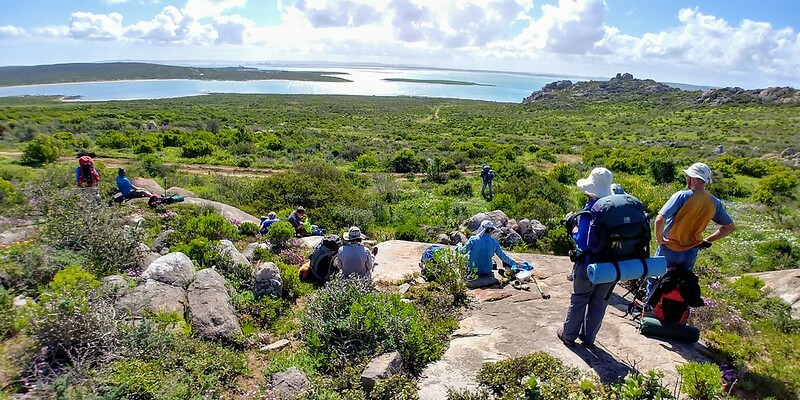 The hike up takes about 2 hours, following a spur through municipal tree plantations before it steepens sharply into the fynbos. The final ascent up a gully is a slight scramble before one emerges on a flat-topped peak rimmed by sandstone ramparts. Two or three people can sleep up there without any danger of rolling off. I often see the flicker of campers’ headlamps against the night sky. It was fantastic to get back into the mountains again on a serious hike for the first time since the back op in February. And the Boland served up the perfect day: warm, windless, impossibly blue, water coursing out of the rock and seeps everywhere, and the veld ablaze with colour. The next day the leg muscles were burning but recovery from the back injury is well underway as we steadily tick off the milestones along the way. 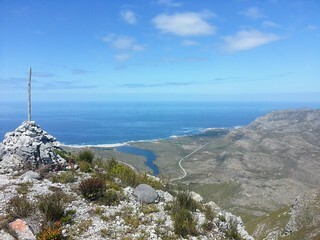 Jonkershoek’s Panorama Trail seldom disappoints. One departs at the Witbrug at the top of the dirt road loop. The trail ascends the eastern rim of the valley, traverses the high, Dwarsberg plateau and descends by one of two routes: the shorter roundtrip down the Kurktrekker, or the longer, full-day hike down Swartboskloof. We left a bit late and so scrambled down Kurktrekker, where the recent rains have made the path a little treacherous. But Cape Nature’s teams are working on the repairs, judging by the bundles of short poles regularly stacked along the way. The shorter route is about 13 km in length and one climbs through 1093 m.
Here is a guide to the South African coastal hikes I have had the privilege of experiencing. Hopefully it is useful to those who are planning to walk our beautiful and diverse coastline. 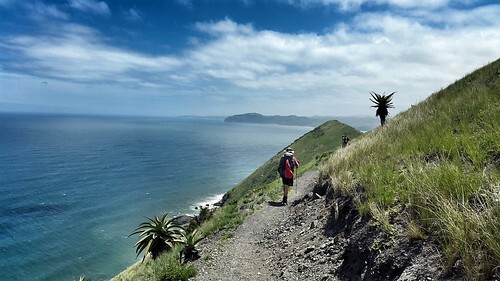 The list starts at the north-eastern-most trail – the Wild Coast Trail from Port St Johns to Coffee Bay – and proceeds around the Cape to the Postberg Trail in the West Coast National Park, which is only open during wildflower season. As I lie here recovering from spinal surgery, I thought I would post about my last hike of any consequence before the double bout with operating theatres, one planned and the other not. Santie organised this classic route ascending Skeleton Gorge from Kirstenbosch Botanical Gardens, following Smuts’ Track to Maclear´s Beacon, across the front table to the cableway and then down Kasteelspoort to Bakoven, where we caught an Uber back to Kirstenbosch. Photos follow. December in the Cederberg is hot. So although Peter and I had all the best intentions of hiking into the wilderness from our camping bases at Sanddrif and Algeria, reality was decidedly less energy-intensive. We took a 9 km round-trip walk to the Maltese Cross and another similar walk up the Rondegat River above Algeria – and I had the opportunity to become better acquainted with the DJI Mavic Pro drone. The clip below is my beginner’s attempt. I fail to understand why I hadn’t thought of it before. The Leopard’s Gorge hike is a perennial favourite: short and scenically spectacular, fynbos and forest. But the logistics of leaving transport at both ends, or walking the gorge in both directions, have never appealed to me. And then on Saturday night I suggested to Marion that we drop the bikes at Harold Porter National Botanical Garden, drive to and hike from Kogelberg, enjoy lunch in the garden, and cycle back to the vehicle. Good exercise, quick and satisfyingly diverse. After the Canal du Midi we rented a car at Carcassonne and drove through the Pyrenees to Torla in Spain, a mediaeval town high up in the mountains near the mouth of the Valle de Ordesa. 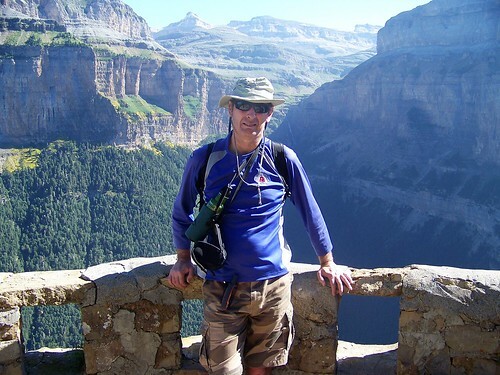 Peter had argued for the canyon to be on our itinerary as it was the third tick on his list of five lesser known but spectacular hikes in Europe. And spectacular it is. Not to mention extremely popular. Most of the hikers in the valley appeared to be Spaniards, young families, daywalkers like us, interspersed with groups of young, harder core hikers, and many with dogs, which is a strange sight in a national park for South Africans. The old towns in the Pyrenees are also either way stations or starting points for pilgrims on the longer versions of the Camino de Santiago. I was privileged to be invited by Sonja to make up the numbers on the Postberg Trail hike almost exactly a year after the previous time. It was a week earlier in the flower season, and although the flower display is not as intense as last time, the peninsula and surrounding waters were spectacular in the late winter light. 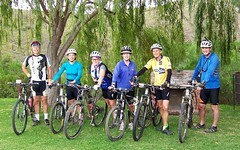 Our cycling tour, organised by Magriet, colleague and fellow, serial Baviaanskloofer, followed a very similar format to the previous cycling tour two years ago and was also timed for the same late-autumn weekend in May. There were four stark differences though: this time we had warm, cloudless days instead of rain and wind; the landscape was charred, the drifts were dry and the road conditions especially on the eastern section were difficult despite being dry. Our route was slightly amended too: Clanwilliam to Heuningvlei, via Wupperthal to Sanddrif, and back to Clanwilliam via Algeria. For those of us who are not fond of technical riding, the stones, steps and sand of the Noodpad (the donkey cart-cart track) were a bit of a trial. 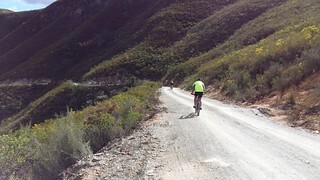 And the section after the steep climb out of Wupperthal to Matjiesrivier became a slog in my book. All vegetation has been destroyed by this summer’s fires and my theory is that the wind has blown sand amongst the pebbles of the gravel roads, making them more “sticky” and slippery than muddy roads. There were 8 of us, 6 cyclists and 2 drivers of the support vehicles, Ralph’s old staatmaker Toyota Hilux and Magriet’s VW Tiguan. All of us, except Marion, Ralph’s wife, had done the trip before, so much was the anticipation of another spectacular week of cycling through one of South Africa’s truly remote and wild places. Our trip started with us camping overnight at the Eagle Falls guest farm in the Kammanassie valley. Tents were pitched and braaing time came and we soon realized that apart from literally going off-grid in terms of not having cellphone signal in the kloof, we would also be off-grid in terms of braaiing, since the essential toeklap rooster had been left at home – guilty parties will not be named for their own protection. Luckily this is South Africa and we could borrow a grid at Eagle Falls. 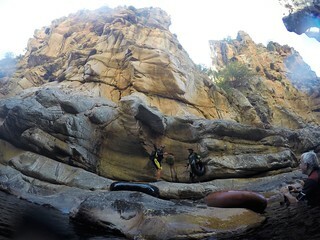 ‘Kammanassie’ is the Khoi San word for ‘mountains of water’ and boy oh boy did we get a first-hand experience of that. I had a small, read minute, orange K-way 1-man hiking tent, but it proved its worth that evening when a thunderstorm of note broke loose overhead. Thunder, lightning, heavy rain thrashing and a wild wind shaking the K-way, but not a drop of water came through as I emerged fresh as a daisy the next morning. This was to be the first day of our cycle tour – Kammanassie through Baviaans. 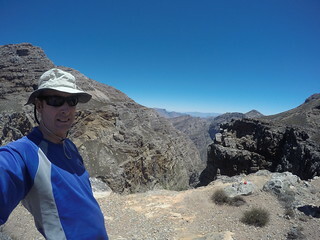 The hike to Perdeberg Peak (640 m ASL) from near the bridge across the Palmiet River is relatively easy, following a gradual gradient over some 11.8 km there and back. It rewards one with spectacular views: south-west over the Bot River mouth, south down to the Palmiet estuary, north into the farmlands of the Elgin Basin and west over the Palmiet River as it winds through the core Kogelberg Nature Reserve. The 5-day, 61 km (69 km by my GPS) Wild Coast hike down the scenic Pondoland coast featuring overnight stays at local homesteads, is one of those must-do hikes. Besides moving through the unfolding spectacle of the shoreline you will gain some insight into a fast-disappearing way of life. 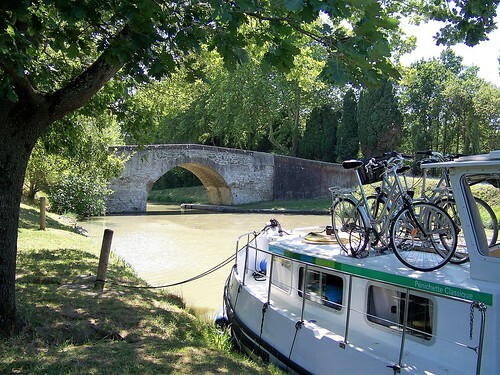 The trail crosses many river estuaries and at least four of them require a ferry. Despite its verdant beauty and the absence of overt industrial development, one cannot escape the sense that the name ¨Wild Coast¨ is a bit of a misnomer. The name evokes untrammelled wilderness, but this coast has been home to the Mpondo people, supporting their pastoral and agricultural society, for centuries. There are pockets of indigenous forest, mostly in the valleys, but all the rolling hills are cattle pastures – grasslands – crowned by traditional homesteads and hamlets. What wildlife that is left is restricted to two small nature reserves and one marine protected area (MPA). By contrast dolphins and whales roam freely at sea. Although the locals have always gathered and fished from the shoreline, harbours and fishing boats are largely absent. On other coastal trails in South Africa, the re-emergence of pairs of black oystercatchers every kilometre or so is noticeable and heartening, but on this coast we saw not even one.